The Fable creator says that people didn't like the mouse at first either. Lionhead founder and Microsoft Studios creative director Peter Molyneux says that he can understand why people are unsure about Kinect, but thinks that although it will take a while for core developers to really get to grips with Kinect, but they will eventually get it, and will start making great games using it. "I agree with the skepticism from core gamers," he said. "[But] when you get past the idiosyncrasies which every control mechanism has, Kinect is a wonderful device to innovate on." He likened the situation what happened in the 80s when the mouse was introduced. He said that, at first, people were saying that it was the worst thing that had ever happened to gaming, but as developers starting to experiment with it, they started coming up with great games that used it to great effect. Molyneux's mouse comparison is surprisingly apt. The mouse on its own is great for certain types of games, but for the majority of core games, it needs a keyboard too. Similarly, Kinect alone is rather limited, but when combined with a controller, it opens up a lot of possibilities. 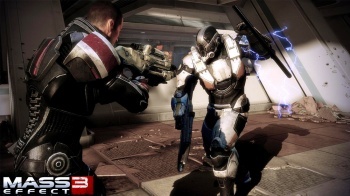 Developers like BioWare are already experimenting with using the two together in games like Mass Effect 3, and hopefully more studios will follow suit.